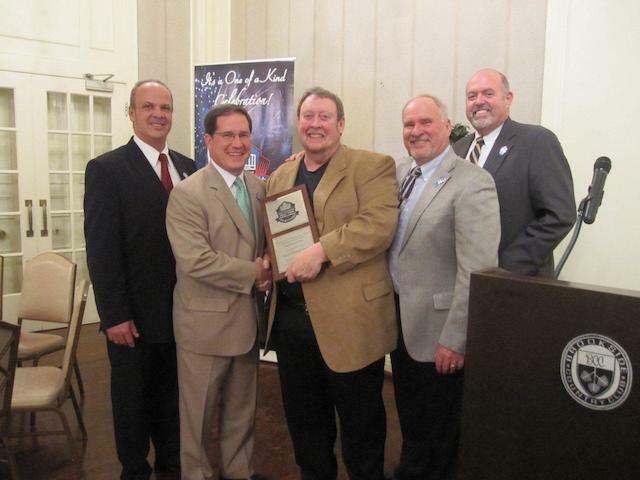 CANTON, OH (September 26, 2012) – The Pro Football Hall of Fame Enshrinement Festival General Chairman Alumni Association held its annual dinner on Wednesday, Sept. 19. The event was emceed by Bill Schauer, current association president and 2006 general chairman. The association is comprised of all general chairmen of the Canton Regional Chamber of Commerce Enshrinement Festival committees since the Enshrinement Festival’s inception; members offer assistance to the Enshrinement Festival in the areas of sponsor recognition, promoting community awareness and support in planning and producing the annual festivities. At the annual dinner, Schauer announced that the annual Individual Award of Merit winners were Mark Copeland and the late Ron Aller of Belden Village Towing. “Belden Village Towing has been a long-time, very generous inkind sponsor of the Enshrinement Festival events, with both Mark and Ron devoting a massive amount of their personal time to transport the golf carts, gators, light towers and generators from event to event,” said Schauer. “They took great pride in being at each event to ensure everything was done properly, and to provide top-notch customer service. They each exemplify selfless service and a ‘how can we help you’ attitude with integrity, loyalty and enthusiasm." Schauer also remarked that since Aller’s untimely passing in May 2011, Copeland has continued the extraordinary support of the Enshrinement Festival, the Alumni Association is honored to recognize both men along with the Belden Village Towing team. Also presented was the 18th annual Corporate Award of Merit to Superior Beverage Group in appreciation of their long and generous support of the Enshrinement Festival. “When Superior Beverage Group bought Fame Beverage in 2007, they continued to support the Enshrinement Festival to the same high level as Fame, and Taylor Beverage before them. Their sponsorship and marketing partnership are critical to several events, as are their guidance and input relative to industry trends and standards,” said Schauer. “Superior Beverage Group provides extensive signage and quality staffing at each event in order to troubleshoot any issues and assure excellence and great customer service.” The award was presented by Maury Sullivan, 1994 general chairman, and accepted on behalf of Superior Beverage Group by Ed Hlad, vice president of the beer division, accompanied by Larry Marino, division manager for Akron/Canton, and Sandy Toma and Frank Cheatham, draft technicians for special events. Another tradition at the annual dinner is the initiation into the association of the most recent general chairman. 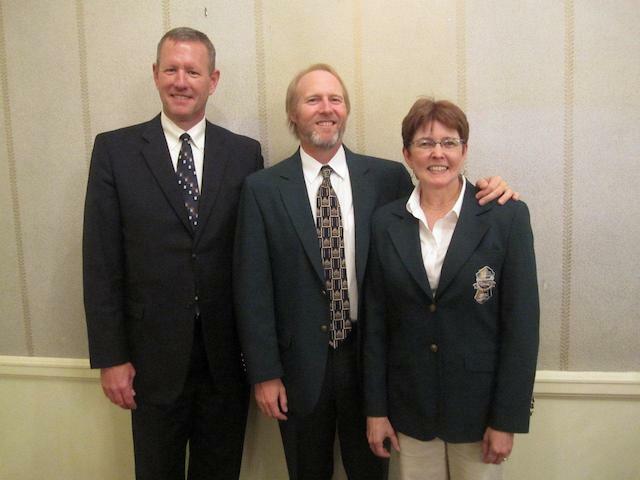 Robert Timken, 2011 general chairman, presented the ceremonial green jacket to Candy Wallace, 2012 general chairman. She was commended for her extraordinary leadership and dedication to the enhancement and growth of the Enshrinement Festival, and was especially recognized for her unmatched, hands-on role in supporting all of the Enshrinement Festival committees. In 2013, Wallace will continue to serve the Enshrinement Festival as chairman of the Chamber’s Steering Committee. Additionally, the Pro Football Hall of Fame and the Chamber’s Enshrinement Festival department have begun to collaborate on plans for their 50-year celebrations in 2013, and Wallace will co-chair the Chamber’s planning efforts along with Timken. While nearly 21,000 men have played in at least one National Football League game, there are only 273 members of the Pro Football Hall of Fame; this number will be increased by not more than seven and not fewer than four when the Class of 2013 is announced Feb. 2 during Super Bowl weekend. The central focus and highlight of the festivities will be the induction ceremony for the Class of 2013 Enshrinees, tentatively scheduled for Saturday, Aug. 3, at Hall of Fame Field at Fawcett Stadium. Added excitement and activities will abound in 2013 as both organizations work collaboratively to celebrate 50 years of success since the Pro Football Hall of Fame opened its doors on Sept. 7, 1963, and the first Enshrinement Festival events were held that year. Since then, more than nine million fans have visited the Hall, which over the years expanded from its original 19,000 square feet to 85,000 square feet. It is now in its second and final phase of the $27 million “Future 50” Expansion and Renovation Project that will be completed in time for the 50th Anniversary in 2013, expanding the Hall to 118,000 square feet and setting the museum on course for the future. Likewise, the annual Enshrinement Festival has expanded from its original four small events to 19 diverse events over a two and a half week period, enjoyed by nearly 700,000 people and producing an economic impact of over $31 million for the Canton/Stark County area and nearly $56 million for the State of Ohio. In addition, millions of people experience aspects of the Enshrinement Festival as events are televised and covered by other media. With a record of success for the past 49 years, the Enshrinement Festival has earned its reputation as “A One of a Kind Celebration!” Check the Web sites periodically for the latest information: www.profootballhofef.com or www.profootballhof.com.